Paddington Vs. Moz: Which Christmas ad is winning online? Over the past few days’ social media has exploded following the release of the M&S and John Lewis Christmas ads. But which ad is winning on social media so far? Data science and media technology company, 4C Insights, unveils engagement and sentiment (definitions below) for the ads, since their release, below. Last night at 11:40pm the John Lewis ad. Yesterday (9th) John Lewis saw 18,769 engagements on Facebook and Twitter and today (10th until 9am) John Lewis had received 50,830 engagements. One of the main reason for John Lewis stats being lower than last year, is due to the difference in release time, last year it was at 7:40am and this year at 11:40pm! Engagement: Mentions, retweets, comments and posts likes from Facebook pages and Twitter handles in Nov – Dec 2016. 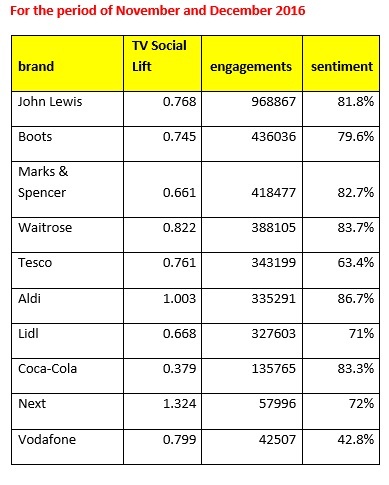 TV Social Lift: By comparing each brand’s social media engagements in the two-minute period after the start of a TV ad to the brand’s average social media engagement rate, 4C calculates the TV Social Lift Impact. Ultimately this is a measure of how much more likely a consumer is to engage with the brand on social media after seeing its TV ad.